Forever finding the most unique ways to approach a beat, ATL innovator Peewee Longway has an unlimited arsenal of flows and cadences. Knocked out by the potency of his drank, Peewee spends the majority of his “I Can’t Get Enough“ video glued to the floor, attempting to escape from the Feds with a meandering crawl. Inspired by a famous scene from Martin Scorsese’s The Wolf of Wall Street, the Omar The Director-directed “I Can’t Get Enough” is a humorous and engrossing clip, proving that Peewee doesn’t even have to stand upright to cut a menacing figure. Premiered by The FADER, and with audio premiered last week by Complex, who said “Peewee exhibits his lyrical prowess, employing a number of tongue-twisting lyrics, almost as if the song is a practice in alliterations,””I Can’t Get Enough” is the lurching, yet spritely lead single from Spaghetti Factory, Peewee’s upcoming mixtape. 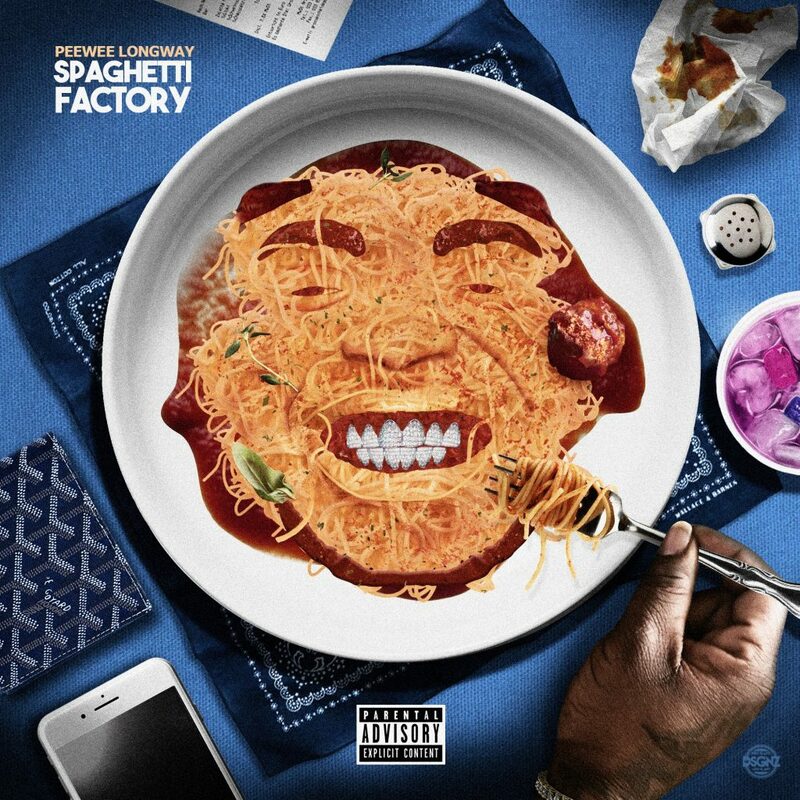 Produced entirely by ATL production duo Spaghetti Jay, Spaghetti Factory releases on April 13th. An influential figure in the ATL trap scene, Peewee Longway is a longtime associate of Gucci Mane and Young Thug, and is responsible for connecting the two back in 2013. Praised by Stereogum, XXL, HotNewHipHop, and others for his distinctive style and songwriting ability, Peewee earned the attention of LL Cool J, who called Peewee his favorite new artist. Last year, the MPA BandCamp rapper released The Blue M&M 3, his 11th mixtape since 2014, which featured appearances from Quavo, Young Dolph, PARTYNEXTDOOR, and Offset, and earned over 1 million Spotify plays with the Cassius Jay-produced, Offset-featuring single “On The Gram.” The follow up to his 2017 mixtape The Blue M&M 3, which features the sleeper hit “Rerocc” (1.6 million streams on Spotify and over 8.5 million views on YouTube), Spaghetti Factory finds the 1017 affiliate bringing his own signature blend of sauce to Spaghetti Jay’s whimsical and aqueous trap productions. Please contact Michelle or Dharmic if interested in talking with Peewee Longway. Peewee Longway, born Quincy Williams, is an Atlanta based artist known for his unorthodox flow and extraordinary use of intonation. Hailing from the tough streets of South Atlanta, Peewee, as his friends refer to him, grew up in a single parent home with one brother and one sister. Regardless of the obstacles he was presented with Peewee Longway still found a way to persevere and become known as one of Atlanta’s most revered lyrical new artists. His debut mixtape Money, Pounds, Ammunition was released in March of 2013. Though most became familiar with Peewee Longway from his affiliation with his mentor, and close friend, Gucci Mane’s label 1017, he actually nurtured and created his own imprint, MPA Bandcamp Music Group. The next release, Running Around the Lobby, picked up steam and earned Peewee loyal fans that call themselves “Lobby Runners”. In turn this became the name to the third mixtape he put out that same year, in December of 2013.